This article guides you in how to save iPhone messages in HTML format. Check out our Droid Transfer page if you need to save Android messages in HTML format. Follow these steps to transfer text messages from your iPhone to your computer. Step 3: On the "Messages" tab, select the messages you'd like to save. Step 4: Press "Copy Messages" and select a location on your PC or Mac for your messages to be stored in. Detailed Descriptions of what TouchCopy can do with you iPhone messages can be found below. To view SMS, MMS, iMessages and WhatsApp conversations on your iOS device, click the Messages icon in the category list in TouchCopy. TouchCopy displays a list of contacts with whom you've had SMS & iMessage conversations. Clicking on the contact in the list shows the text (SMS), multimedia (MMS) and iMessages sent and received in that conversation. You can also search your contact list by name to display all messages by a particular contact. Your WhatsApp messaging contacts and conversations are displayed under your SMS contact list. You can filter your messages using the "Apply Date Range" button. Setting a date range will only return messages marked within the range specified. You can cancel this filter by using the "Clear Date Range" button. How to save text messages to computer: With a contact selected and a conversation displayed, click "Copy Selected Conversations" in the TouchCopy control bar to save that conversation to your computer. Select multiple contacts to copy multiple conversations at the same time. You can chose the save location for the copied messages within TouchCopy. 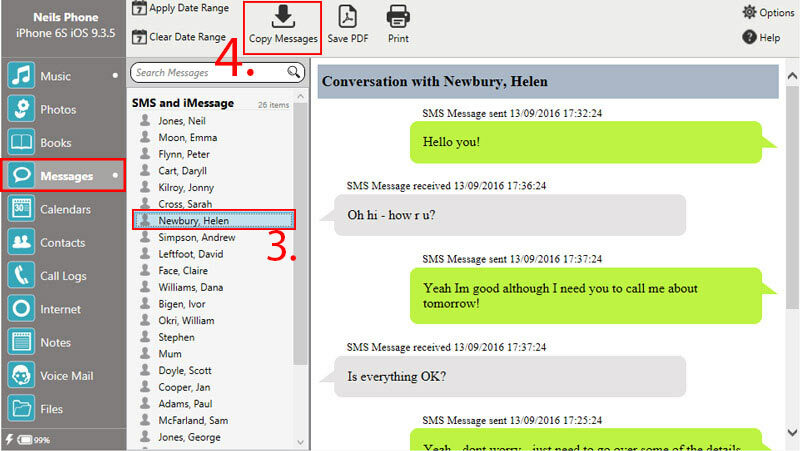 TouchCopy saves the selected conversations as .html files, with each .html file named after the individual contact. You can open these .html files using a browser such as Firefox, Chrome or Internet Explorer. If your conversations also contain images or videos (MMS), TouchCopy will also copy these to your computer and embed them in the .html file saved. TouchCopy will create an additional folder containing images and videos sent as part of your MMS and WhatsApp conversations. The images are saved as JPEG files, whereas your videos are saved as Quick Time Movie (.mov) files, so you can easily view and play these back on your PC or Mac. Cleverly, TouchCopy even treats and organizes group messages, so they retain that format. Your group messages are displayed and copied by TouchCopy as they are displayed on your iPhone.